The debate about whether or not entrepreneurship can be taught is being laid to rest because there is now a consensus among scholars that, though the teaching of entrepreneurship is a science as well as an art, it can be taught. This has equally led to the rapid expansion of entrepreneurship education within its offerings at higher educational institutions. While entrepreneurship is being offered as a degree programme at both undergraduate and graduate levels, in some countries, the education is offered within the curriculum of primary and secondary education as well as in vocational training and lifelong learning settings. Despite these remarkable developments, the consensus is yet to be reached on what and how entrepreneurship should be taught. This has led to the adoption of different pedagogic approaches by different countries and higher institutions. The recent thinking, however, suggests that there is a changing pattern from conventional teaching to modern methods based on action learning. As noted by Brush, Neck & Greene (2015), a practice-based approach will encourage students to go beyond rote memorisation of the content of entrepreneurial discipline, but navigate the discipline through practices of play, emphathy, creation, experimentation, and reflection. Consequently, the awareness of this shift elicits the need to compile the experiences of various entrepreneurship educators to further understand the opportunities and challenges associated with entrepreneurship education as well as its future directions. These experiences will assist in understanding what is working and what is not. It is important to note that entrepreneurship education has gone beyond the specific concept of a business startup, but now includes a broader concept of education that can develop entrepreneurial attitudes and skills of students, hence it still holds great opportunities for the future. That is, the problems of the world today, especially as it relates to poverty, inequalities and sustainability, needs students and leaders who can think and act entrepreneurially in order to act on opportunities that generate economic and social value (Brush et al., 2015). Considering these great potentials of entrepreneurship education, there is a need for educators to be innovative and enthusiastic, as well as having a positive attitude toward and self-efficacy in entrepreneurship. Therefore, every support is required for entrepreneurship education, especially in the new age of economic knowledge. 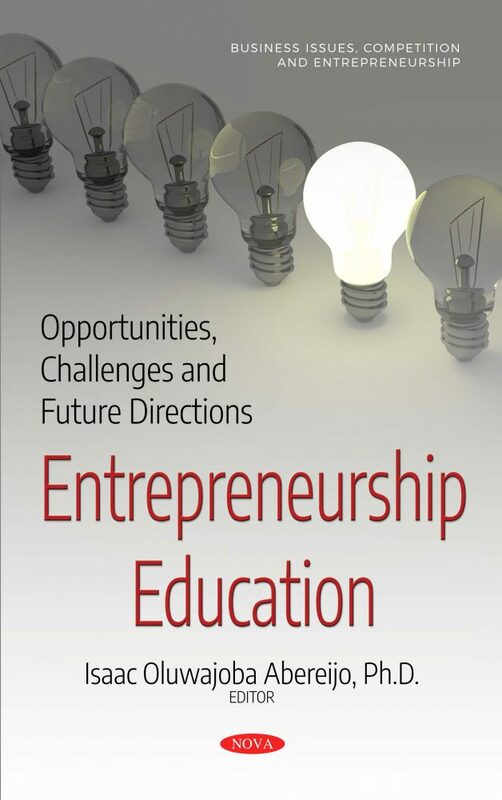 Audience: Entrepreneurship researchers and educators, as well as entrepreneurship policy-makers are the primary target audience of this book. However, other stakeholders, such as administrators of higher educational institutions, who are interested in setting a good stage for entrepreneurship education in their institutions, would also find the book useful.